Does disillusionment with the current revolution — especially the role of the military — echo the disappointment that followed the 1952 revolution? 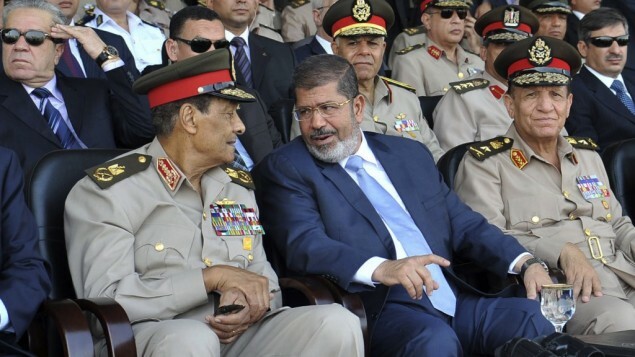 President Morsi claimed last month that the new revolution had “corrected the path” that the first revolution had faltered along. There’s a review of a play put on by students at Ain Shams University by Mona Hashish of Suez Canal University in the latest issue of Middle Eastern Literatures. Entitled “Echoes of the January 25th Revolution,” it describes an 8 Dec 2011 production of Rijal Lahum Ru’us (Men Have Heads). Written in the 1960s by Mahmud Diyab, the play describes the disillusionment of a couple with the 1952 revolution in ways that resonate strongly with many peoples disillusion over the 2011 revolution. In his play, Diyab tackles a couples disillusionment with the reality of the 23 July 1952 revolution. The collective will crushes the individualistic demands of the people, and justice is not realized. Mubarak’s regime was as corrupt as that of Nasser [does she mean King Farouk’s regime? That was the one overthrown]. The 2011 revolution has not helped people any more than the 1952 revolution did because both revolutions have been foreclosed by the armed forces who recognize only dictatorship. In both eras the army enjoys complete authority, hinders democracy, and transforms the country into a police state. The play starred Iman Mansur and Majdi al-Mansub. It was directed by Umar Tawfiq. (You can read this play in English in Short Arabic Plays: An Anthology edited by Salma Khadra Jayyusi (2003, Interlink Books)). Hashish, Mona. 2012. Echoes of the January 25th Revolution. A recent performance of Men Have Heads by Mahmud Diyab. Middle Eastern Literatures 15(2): 223-225. I am the author of the review article. I believe the play describes the 1952 Egypt when the military people, headed by Nasser, came to power, and changed the country into a police state. In 2011, the revolutionaries ousted the dictator Mubarak, and the military people took over again until free elections were held, and we, Egyptians, got rid of the rule of the army. . Field Marshal Tantawi supported the pro-Mubarak man Ahmed Shafiq, and forced the people to choose the pro-Mubarak man or the Islamist Morsy. The majority has chosen Morsy to go forward , not backward again to the same totalitarian regime of Mubarak. The students chose that play because at that time in Egypt in 2011, the Egyptians were being manipulated by the army. This is similar situation to that in the play that tackles Egypt in 1952. To sum up, Ain Shams University students were saying NO to the military rule in an indirect way.